11 based on function and appearance. You can also increase sales by selling pre-made blue light eyewear to plano patients who don't wear eyeglasses or who only wear readers. BLEP offers readymade computer readers with blue light protection. Maintain a good stock of ready-to-wear eye- glasses, and don't forget to stock uncuts if you edge. That way you can meet the needs of those who want to select a special frame for their computer eyewear. Part of our job as optical retailers is to be educators. It is our responsibility to become informed about the harmful side effects of exposure to HEV, both short- term (such as the impact on sleep cycles) and long-term (the oxidation of retinal cells resulting in macular degeneration). 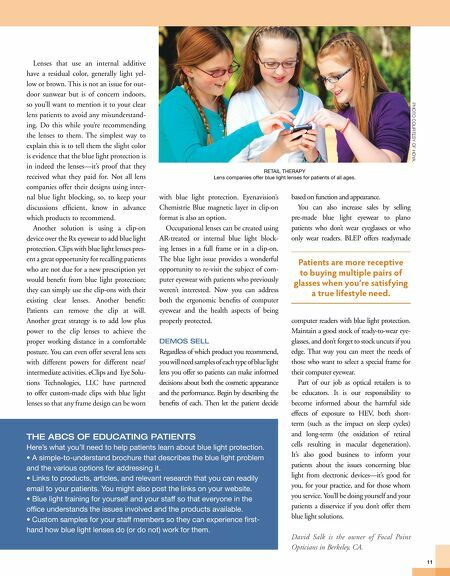 It's also good business to inform your patients about the issues concerning blue light from electronic devices—it's good for you, for your practice, and for those whom you service. You'll be doing yourself and your patients a disservice if you don't offer them blue light solutions. David Salk is owner of Focal Point Opticians in Berkeley, CA. with blue light protection. Eyenavision's Chemistrie Blue magnetic layer in clip-on format is also an option. Occupational lenses can be created using AR-treated or internal blue light block- ing lenses in a full frame or in a clip-on. 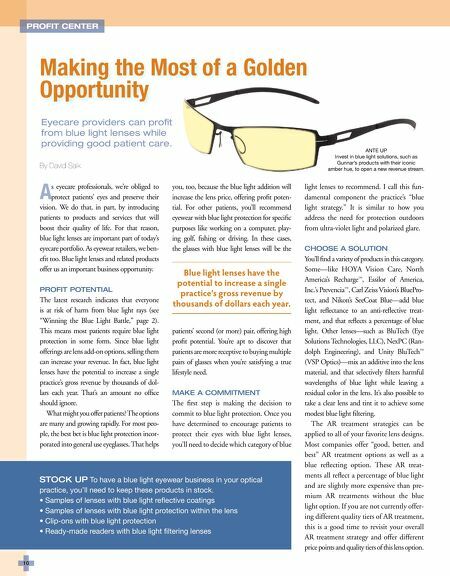 The blue light issue provides a wonderful opportunity to re-visit the subject of com- puter eyewear with patients who previously weren't interested. Now you can address both the ergonomic benefts of computer eyewear and the health aspects of being properly protected. DEMOS SELL Regardless of which product you recommend, you will need samples of each type of blue light lens you offer so patients can make informed decisions about both the cosmetic appearance and the performance. Begin by describing the benefts of each. Then let the patient decide Lenses that use an internal additive have a residual color, generally light yel- low or brown. This is not an issue for out- door sunwear but is of concern indoors, so you'll want to mention it to your clear lens patients to avoid any misunderstand- ing. Do this while you're recommending the lenses to them. The simplest way to explain this is to tell them the slight color is evidence that the blue light protection is in indeed the lenses—it's proof that they received what they paid for. Not all lens companies offer their designs using inter- nal blue light blocking, so, to keep your discussions effcient, know in advance which products to recommend. Another solution is using a clip-on device over the Rx eyewear to add blue light protection. Clips with blue light lenses pres- ent a great opportunity for recalling patients who are not due for a new prescription yet would beneft from blue light protection; they can simply use the clip-ons with their existing clear lenses. Another beneft: Patients can remove the clip at will. Another great strategy is to add low plus power to the clip lenses to achieve the proper working distance in a comfortable posture. You can even offer several lens sets with different powers for different near/ intermediate activities. eClips and Eye Solu- tions Technologies, LLC have partnered to offer custom-made clips with blue light lenses so that any frame design can be worn Patients are more receptive to buying multiple pairs of glasses when you're satisfying a true lifestyle need. THE ABCS OF EDUCATING PATIENTS Here's what you'll need to help patients learn about blue light protection. • A simple-to-understand brochure that describes the blue light problem and the various options for addressing it. • Links to products, articles, and relevant research that you can readily email to your patients. You might also post the links on your website. • Blue light training for yourself and your staff so that everyone in the offce understands the issues involved and the products available. • Custom samples for your staff members so they can experience frst- hand how blue light lenses do (or do not) work for them. PHOTO COURTESY OF HOYA. RETAIL THERAPY Lens companies offer blue light lenses for patients of all ages.